A beautifully well-crafted artwork has always been the first thing to catch the attention of my eyes and seduced my mind. It’s one of the first and most important impressions to me of a new act, which either strengthens my curiosity to begin digging in the holy ground of the band and unveil what treasure of music lies hidden beneath it or just to let it stay buried forever. There is no exception to that rule with my latest acquaintance, the prog metal act called Ashent. The artwork created by Mario Sanchez Nevado is a haunting and stunning piece of art, and so I began digging…after many hours of hard work with sweat in my ear channels, a small polished prog pearl had revealed itself. After three years of wait, the sextet of “Ashent” hailing from the boot shaped country called Italy, have finally returned to the surface of our precious world with their latest effort “Inheritance” and third contribution to the prog metal scene, introducing us to an almost complete new line-up as well. With half of the troop fleeing after the release of their sophomore album entitled “Deconstructive” in 2009, the hunt for three new faces to fill out the empty spots had begun. The much needed reinforcement to the troop of already gifted musicians consisting of Davide Buso (drums), Onofrio Falanga (guitar) with his wingman and brother Gianpaolo Falanga (bass) was completed, when the experienced lead vocalist Titta Tani (ex-DGM, Goblin and ex-Necrophagia), guitarist Alessandro Cossu and Gilles Boscolo (keyboards & saxophone) were caught and brought on board on one of the leading prog metal ships sailing in the seas of Italy. 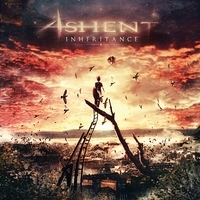 With this release Ashent will try to step out of the shadow of their ancestors, the prog titans and legends by the name of “Dream Theater” and “Fates Warning”, by reinventing themselves again with a new upgraded sound and line-up. An epic voyage, running 57 minutes of playing time, into the unexpected has begun, including the mellow sonic waters previously unexplored by the band itself with a track list consisting of eleven songs of which two are instrumentals. Their latest mature effort tries to avoid a lot of the prog metal clichés that have been around for the last few decades, and its refreshing sound is definitely a welcomed change to the always traditional structure of progressive metal with less focus on the highly technical solo guitar rifferage, the overdose of shredding madness, endless dominating keyboard shreds and epic lengthy songs reaching past the ten minutes marker, but what is then left for the progheads out there? Let me enlighten your minds, our fellow readers. The eleven songs will be flooding our ear channels with streams of mellow and soothing melodies that will be rushing to our brain. Fuse those melodies with the tones from a saxophone, orchestral parts, choirs, synths, unusual time signatures, heavy riffs, all of it performed with utter technical perfection, and layered on top of the shifting musical landscape from its mellow atmospheric layers to a technical chaos of sounds from the sheer amount of things going on, and you get the picture of what to expect. However each of the eleven songs still seems to manage staying glued together perfectly and it actually works well with the dynamic emotional voice of the new frontman Titta Tani who is complementing perfectly each node played with his very controlled characteristic, and almost “laid-back” singing style. So let’s cut to the chase, did they succeed? Maybe their take on progressive metal is not turning the entire prog genre upside down, but it’s still quite distinct and unique. Give it a couple of spins and it will open up, showing you pieces of its fully potential, and have a chance to seduce the open minded, giving you an unforgettable journey and lulling you to sleep during the many dark hours of the winter season.